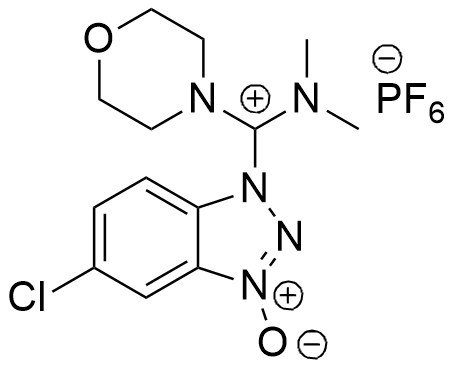 HDMC is an aminium-type coupling reagent derived from dimethylmorpholino urea. In addition to decreasing the racemization level, the morpholine moiety has remarkable effect on the stability and reactivity of the reagent. HDMC is distributed exclusively in north America market by Gyros Protein Technologies (for quantities below 35 kg per order). HDMC is a registered patent of Luxembourg Bio Technologies (No. 101784522/8,524,898). HDMC used together with OxymaPure® has been used to prepare COMU in situ and therefore to overcome the rather low stability of COMU in solvents such as DMF. HDMC/OxymaPure combination has been found to be the best coupling reagents for Automated Peptide Synthesizer. A. E. Faham and F. Albericio J. Org. Chem. 2008, 73, 2731-2737.